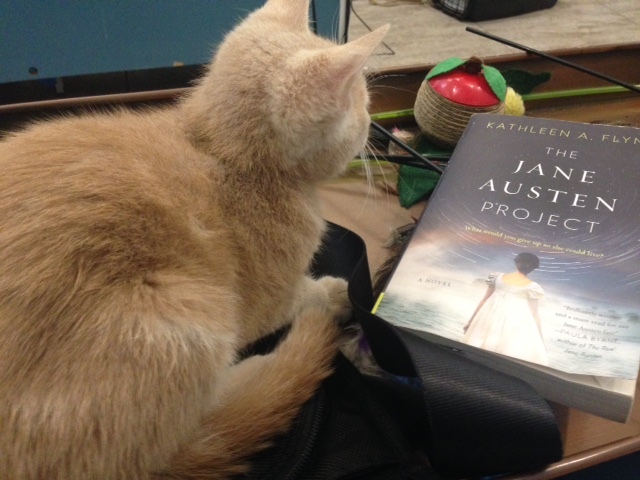 I’ve fallen behind on this, what with all my reading to cats and humans and Jane Austen conference-attending, but it’s come to my notice that a few book bloggers have said some really nice things about Project recently. Honestly, so much could have gone wrong with this novel. And I have to admit that I kind of expected it to. I was intrigued by the summary when I started it, but I had pretty low expectations because I’ve been let down by so many Austen-related books before. That’s the risk you take when you follow a book hook into uncharted territory. However, I’m so pleased to be able to say that The Jane Austen Project far exceeded my expectations – and is already one of my favorite reads of 2017! Though an Austen manuscript is unlikely to be found IRL, Flynn’s book really is the next best thing. Highly enjoyable, smart, and quite a page turner. If you are a Jane Austen fan, and even if you aren’t (but especially if you are), you don’t want to miss this one. Sure, a book about Jane Austen and time travel sounds dicey, but The Jane Austen Project is smart, fun, and unputdownable. This is the part that’s still so weird to me, that after living in my head so long, this book is in the world, and people are reading it. Thanks so much, you guys! Thanks for reading, for your great blogs, and for spreading the word.